Welcome to what heaven looks like. If there was ever a perfect way to welcome in October, this is it. OH MY GOSH YOU GUYS. This freaking mac and cheese. Holy cow. It is delicious, full of flavor, classic enough that you can serve it to a crowd but unique enough that you won’t get bored and the recipe is pure perfection. 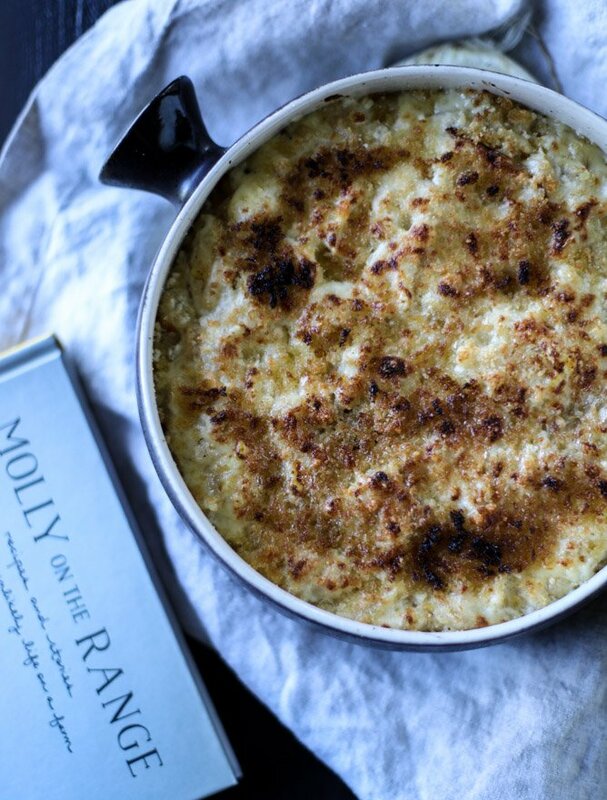 This mac and cheese comes from Molly’s new book Molly on the Range. Let’s just take a second to talk about how absolutely awesome Molly is. She makes fabulous food. She is the queen of funfetti. Her photos always tell the perfect story and they are warm and welcoming and wonderful. She’s HILARIOUS. I read the intro of the book a few weeks ago and was laughing out loud. The story of how she met her husband and their first kiss had me in stitches. She is such an excellent writer which makes me love the food she is writing about so much more. One thing I really admire about Molly (and this book!) is that anytime I visit her blog, I almost always learn something new about food. Her recipes are so full of culture, but not it an intimidating or snobby way. In the most relatable, oh-my-god-I’m-trying-that-right-now sort of way. She is solely responsible the unreasonable amount of tahini that I have bought this year. And because of all that, I have to tell you that this is not only one of the best best best cookbooks I’ve got in 2016 but maybe one of the best cookbooks ever. If you are like me and enjoy reading cookbooks like novels – no, really, like if you prop yourself up in a bed with a huge stack of cookbooks which are inevitably hardback making for an awkward and uncomfortable situation IN BED, you’ll be in heaven. I pretty much want to make every recipe in the book. I think I’ve found the new base for my mac and cheese recipes for the rest of my life. This recipe is foolproof and so decadently creamy. 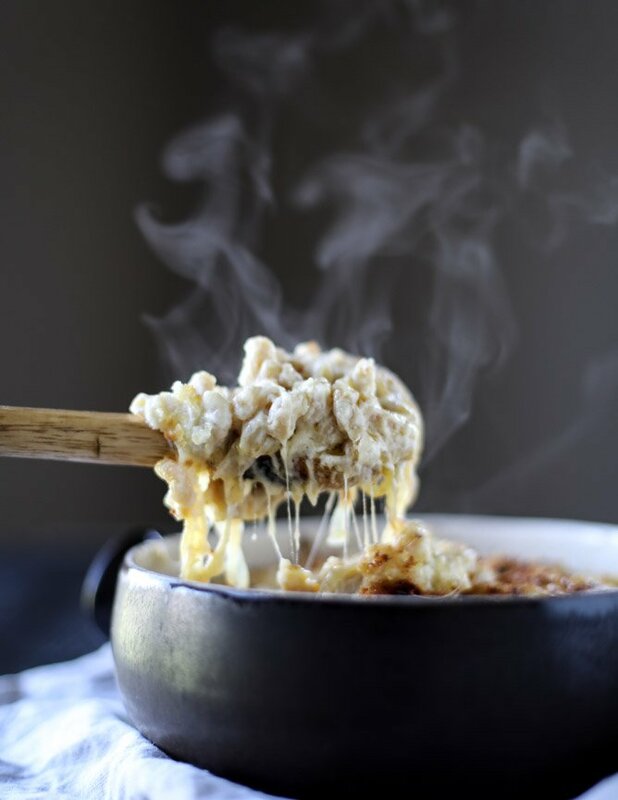 I’ve had a fond spot for gruyere ever since my mom used to make us fondue when I was a kid (from her college fondue pot in the ‘70s, no less) and it’s almost always a staple in my mac and cheese recipes. However. I never just let it shine. By itself. You know? And now that I have, I may not ever be able to use other cheese again. Swiss cheese freaks, unite. And grab some very large spoons. This dish has every single component that my heart and brain and face require in a mac and cheese. Creamy. Flavorful. A little nutty. Something extra. Crunchy topping. Life = complete. In a large skillet, melt 2 tablespoons of the butter over medium-low heat. Add the onions with a pinch of salt and cook, stirring occasionally, until they are golden and caramely, about 40 minutes. 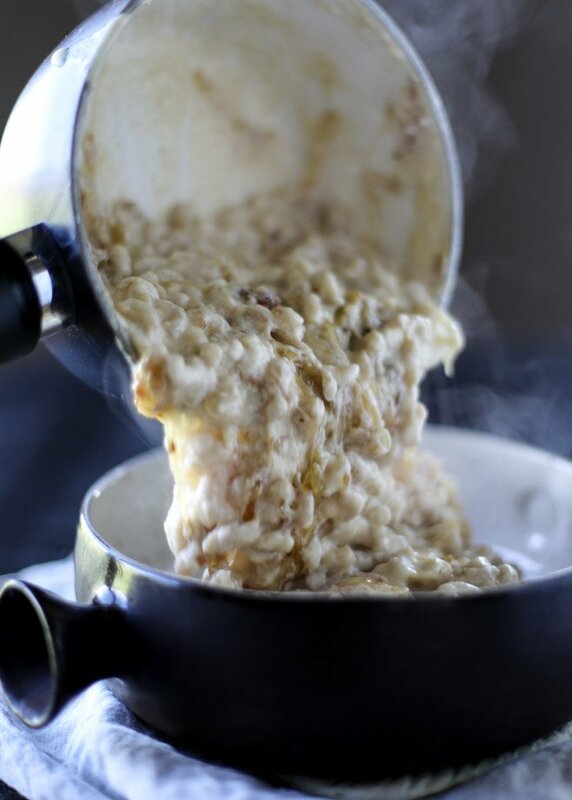 In a large pot, melt the remaining 4 tablespoons butter over medium-high heat. Add the flour, whisking until combined to create a roux. Cook for 1 to 2 minutes until it’s golden and fragrant. Slowly pour in half the milk, whisking constantly so they mixture can thicken, about 5 minutes. Slowly pour in the other half of the milk and whisk until thickened. Reduce the heat to low and add the gruyere and swiss and all but 2 tablespoons of the parmesan. 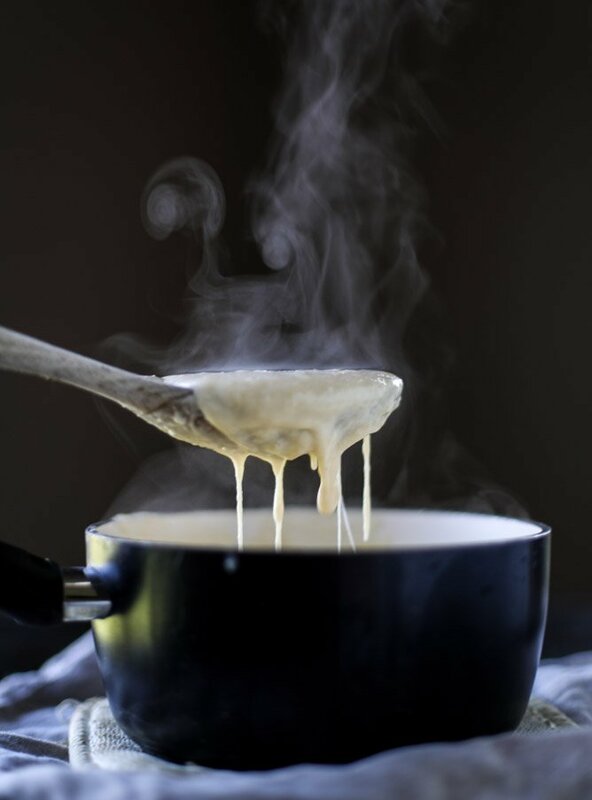 Stir with a large wooden spoon until the cheese melts. Stir in the paprika, cayenne, nutmeg, mustard and any salt and pepper to taste. Stir in the cooked pasta and the onions. Transfer the mixture to a baking dish and top with the panko crumbs and remaining parmesan. Bake until the top is golden and crunchy, about 25 minutes. Cook for a few minutes before serving. 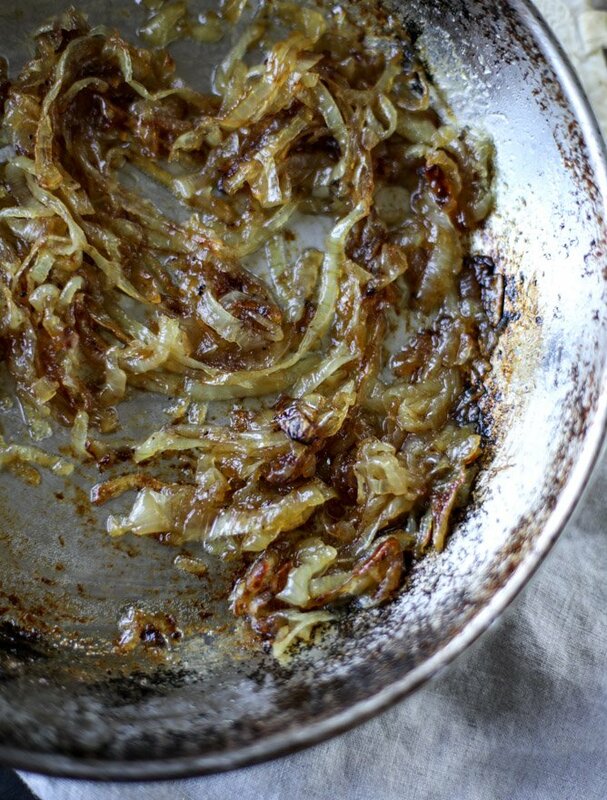 Those caramelized onions are EVERYTHING here. Wowza. Yum! And totally agree with you about her blog/writer’s voice. So much fun. this is like french onion mac and it is making me HAAPPPPYYYY!!!!! Pharrell style. omg yes, love that comparison. Not only does the recipe look and sound delightful, I’m smitten with Molly’s cookbook and cannot wait to get my own copy! just wait!! you will love it! 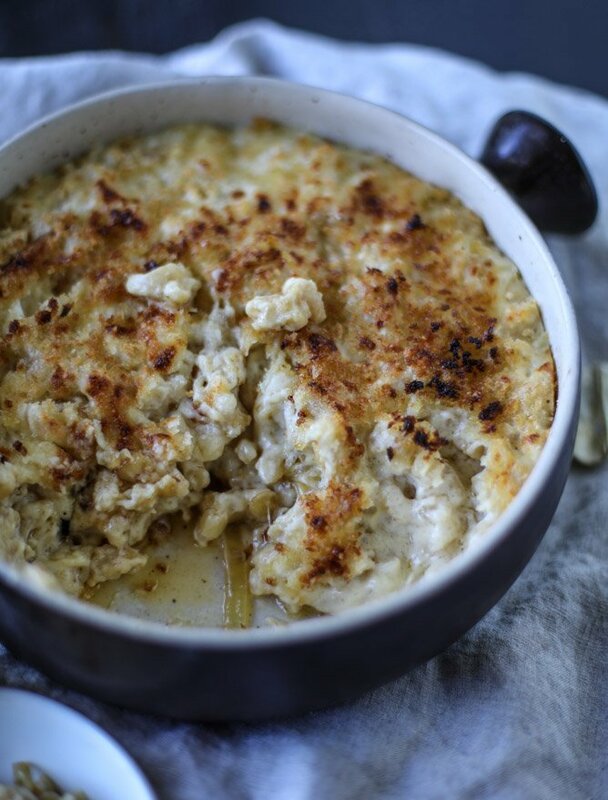 I love Mac and cheese and the idea of caramelized onions with it sounds soo good. Plus, that crunchy top! Can’t wait to try this! i hope you try andrea! so good. triple cheese and caramelized onions?! YES. also, i love reading cookbooks in bed, on the floor, at the hairdressers, on mountains (i brought a cookbook to a camping trip once), so i’d probably be able to read motr anywhere and be veryyy happy. haha that is my life. This is all I want in life. Those uuurrrnions, doe. Gorgeous as always! I can do this, it’s getting cold and I need new slippers. I may even add some Lobster to it or greek sausage , crusty artisan bread and a glass of Merlot. Gruyere is EVERYTHING. 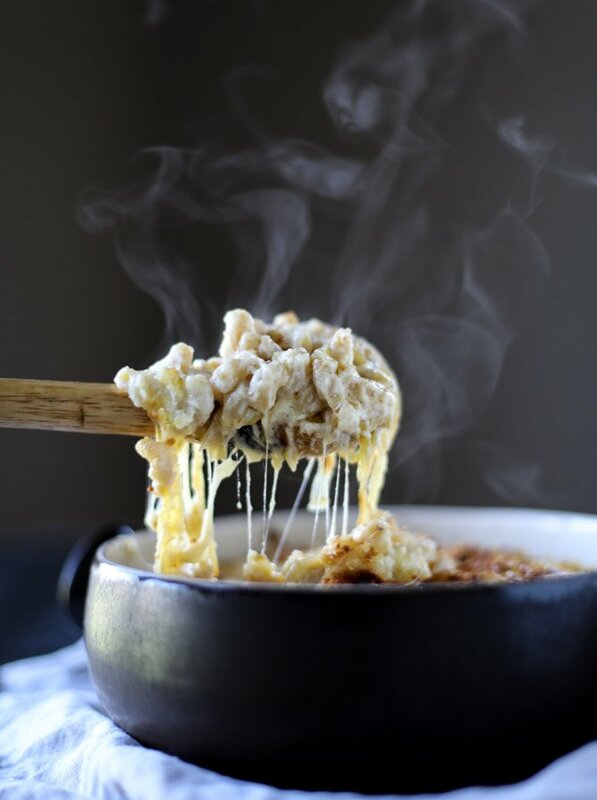 A staple cheese in my fridge <3 Need to try this mac and cheese! I’ve never had mac n cheese with gruyere or caramelized onions before. It’s really cool that you mom still had her college fondue pot though – looks like that came in handy for many years! Now I’m in the mood for fondue! I am sticking my nose up to the onions, but give a high five to the mac n cheese! Swoon! Looks wonderful, especially if I add bacon for my meat lovers. Do I cook for a few minutes at the end or cool? And I still have those same 70’s fondue pots that I use every year for a fondue party. 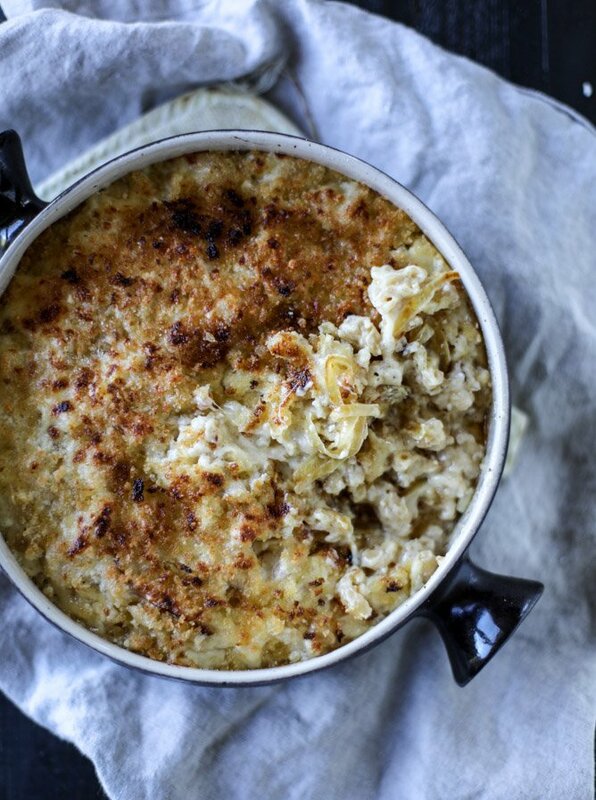 So hearty, so cheesy, soooo gooood!! How much cayenne? 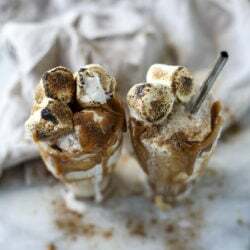 (in the instructions but not listed in the ingredients) Can’t wait to make this! Oh. My. I will be making this. Soon. Making my grocery list now! I’m using it now and it’s awesome! I’ve signed up for my account and have been bringing in fat paychecks. For real, my first week I made $303 and the secondd week I doubled it and then it kinda snowballed to $120 a day! juet folllow the course..
Jessica, I’m SO glad I found you! This mac and cheese does look like Heaven. I’ll definitely have to try it out as a treat to myself (maybe my friends too, we’ll see, haha)! P.S. Bacon makes me beam too. I made this on Saturday for a dinner party and it was a HUGE hit! Thank you for sharing – and thank you Molly for creating it. for anyone trying this, I thought the flavors were amazing! but I felt the proportions were a little off while making it and after I ate it, it was confirmed. 8 oz of mac was not enough, I added a tiny bit more but in the end I wish I would have added at least 10-11 oz of mac. Next I was thinking too much milk. I would say 2 cups rather than 2.5 would do the trick. It thickened up nicely for the first portion, then when I added the rest in, it took quite a while before I felt it was thickening up. All in all, the taste was great, but a bit too rich… more mac and it would have been perfect in my opinion! Your pictures are jaw-dropping. I can’t believe how beautiful the smoke looks. I have to make this- but I want to add a little gorgonzola. Call me crazy!! Thank you for making beautiful cheesy pics! This looks almost too good to be true! Thanks so much for sharing, Jessica! 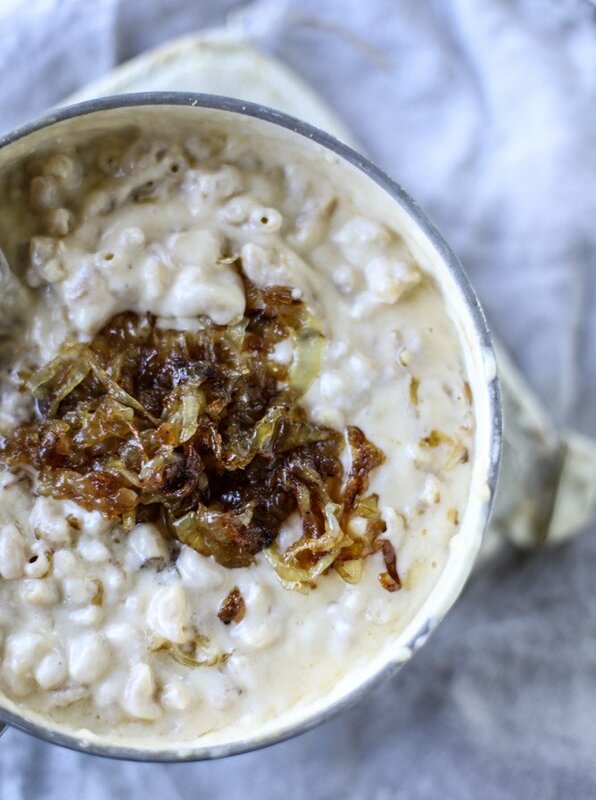 I adore Molly’s blog and her writing style and most definitely her recipes! This. looks. insane. Can I make the dish and then put it in the oven for the 20 mins or whatever after sitting in the fridge, the next day? 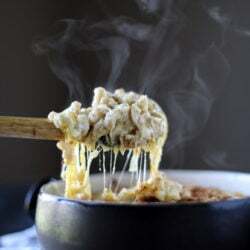 Pingback: Recipe Wednesday: Macaroni and Cheese! I made this last night, and it was divine! But when I was adding the spices to the cheese mixture saw that cayenne was mentioned, although it’s not in the list of ingredients. How much cayenne? I put a teaspoon in, and my husband commented that the cheese sauce really had a kick. I also assumed you meant “cool” for a few minutes before serving, not “cook” ;-).